How do the adult bands work at Join the Band? Join The Band® offers an easy and comfortable way for adult musicians of all ages and skill levels to join a band and start performing. Whether you are a beginner, intermediate or advanced student, Join the Band can also place you with the right private music teacher for your needs. 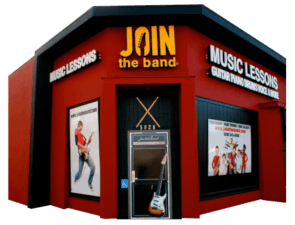 At our Sherman Oaks / Los Angeles studio we have adult music lessons and adult bands for guitar, drums, piano, keyboards, bass guitar, voice and more at our studios. Maybe you’ve played in bands before, but had to put that part of your life on hold for career or family. Perhaps you just don’t know anyone you can play with. Musicians in the adult bands at Join the Band® are placed with other musicians of similar skill level and music style preferences. Our adult bands learn and perform a wide variety of music from classic rock, blues, jazz, metal, country and more. What are the benefits for the adult bands at Join the Band? Our Sherman Oaks rehearsal environment is welcoming and supportive. The idea is to have fun, get better, and most importantly, to keep that inner rocker alive in you! You and your band will rehearse in our professional Join the Band studio under the guidance of a professional musician and experienced music teacher. All the equipment is at the studio. You do not need to shlep your gear to rehearsals. Drums, amps, PA, microphones are at the studio waiting for you. The rehearsals are efficiently run by our qualified JTB Band Leaders. All you have to do is practice and show up to play. Then, you get to show off the results of all your practice at a real gig, in front of a packed house at one of our famous Join The Band® Concerts. “Join the Band” adult bands regularly perform at popular Los Angeles music venues like The Mint, Federal and Roxy Theater. What are band members saying about being in the adult band program at Join the Band? Your teacher (Band Leader) will guide you through our proven Join the Band System. No matter if you’re rusty or you’ve still got your chops. 2. Improvising and playing solos. 4. How to get the right sound. Choose an adult rock band program that limits each band size. Choose an adult rock band program that schedules age appropriate bands. Choose an adult rock band program with experienced music teachers. Choose a reputable adult bands program with a fun & professional studio environment. Note: We also feature Blues, Jazz, Country bands and more.